Alongside commercial ventures, local governments and police are using social media monitoring products to probe posts on sites such as Facebook, Twitter, Instagram, Youtube, Google+, and Vine for information on protests, potential threats, breaking news, and more. Hennepin County in Minnesota is featured on the map. Unlike the simple search of a hashtag or keyword that anyone with access to the internet can perform, social media monitoring products have the capability to read, interpret, and categorize millions of posts in mere minutes, allowing users of the software to stay on top of discussions on social media in real-time as well as search through historical archives of social media posts. Some social media monitoring products claim that they can even interpret the nuances of sarcasm in posts, evaluate the credibility and influence of a message, chart out the relationships between various social media users, recognize and create alerts based on images (including emojis), and pinpoint the movements of individuals. In short, social media monitoring technology provides the capability to constantly monitor and archive information on millions of people’s activities. Unsurprisingly, law enforcement agencies are increasingly using these tools; according to a 2015 survey by the International Association of Police Chiefs, 96.4% percent of law enforcement agencies surveyed used social media in some capacity, including over half for listening or monitoring and three-quarters for intelligence gathering purposes. News articles indicate that software is used to compile evidence for criminal investigations, shorten emergency response times, alert police to potential threats, detect trends in activity, and analyze sentiment levels in postings. But the technology can also be used to monitor political and social justice movements, posing risks to First Amendment-protected activity. For example, according to news reports, police departments may have used products from Geofeedia, Media Sonar, and DigitalStakeout to monitor Black Lives Matter activists. During the Freddie Gray protests of 2015, Baltimore police used Geofeedia’s real-time monitoring to run social media photos through facial recognition technology, in order to discover rioters with outstanding warrants and arrest them directly from the crowd of protesters. Investigations have revealed that some companies even marketed their services to law enforcement for monitoring of protestors. In some cases, public safety agencies have used software that pulls in a wealth of information, including social media data, to assign individuals “threat levels.” Some companies allow law enforcement to create “undercover accounts,” or “targeted friend requests” that law enforcement believes the subject will accept – including “accounts depicting ‘attractive women’” or accounts purporting to be from an actual friend or acquaintance. Police have also made it clear that they know the identity of protestors at times, such as when a police officer called activist Ashley Yates by her twitter handle @brownblaze at a New York protest. While a few such anecdotes have come to light, very little is known about how, when, and why social media monitoring technology is used by law enforcement. With the exception of information obtained through freedom of information law requests, there is almost no way for the public to determine whether their local police department or sheriff’s office possesses social media monitoring software, much less obtain information on their policies regarding the use of such software. In an effort to bring greater transparency and attention to this issue, the Brennan Center has created a map that depicts the cities and counties across the United States that have spent at least $10,000* on social media monitoring software, according to public reports, information from the government procurement database SmartProcure, and information from public records requests, particularly via the ACLU of Northern California and the investigative news site MuckRock. The map focuses on purchases of eight social media monitoring products for which data was available: Geofeedia, Media Sonar, Snaptrends (now reportedly closed), Dataminr, DigitalStakeout, PATHAR, Meltwater, and Babel Street. The map also indicates years in which purchases were made. Three caveats are in order. First, the information we collected from SmartProcure documents only the purchases of social media monitoring software; these purchases may not necessarily indicate use of the product. Second, when we looked at SmartProcure, we found that most purchase orders for these products were made by cities or counties, rather than specific police departments or sheriff’s offices. It is possible that this is the result of the way local agencies conduct business. For example, in some regions it may be the city government or administrative office that is tasked with managing budgets for all the different agencies that fall within a city. As a result, we cannot say with certainty whether a city’s purchase is being used by law enforcement. We can confirm that all of the products included in the map were either marketed to the “public sector” or marketed for the express purpose of managing “public safety”; however, most of the products can be used for additional purposes that extend beyond conducting investigations or gathering threat intelligence, such as gathering information for marketing and branding, monitoring the security of corporate assets or detecting threats to cyber-security. Third, the map does not include federal agencies like the Federal Bureau of Investigation, Drug Enforcement Agency, Central Intelligence Agency, or the US Marshals Service. These agencies have spent significant amounts of money on social media monitoring software according to several news reports, and have even invested in the development of some of the products included on the map. 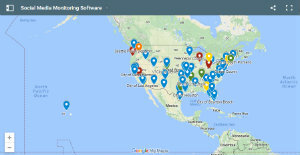 The map also does not include purchases by fusion centers, major information-sharing hubs that connect the local, state, and federal government and the private sector. Further, the map does not include information on the purchase of social media monitoring software by public schools or school districts, given that these institutions are not specifically oriented toward law enforcement or public safety. We plan to keep this map updated as more information becomes available. If you have any information regarding a local government or law enforcement agency’s purchase and utilization of social media monitoring software that is not indicated on the map, please contact andrew.lindsay@nyu.edu. Find your city, county, state. Hennepin County in Minnesota is featured with details of money spent. *Where available, sales tax amounts were included.